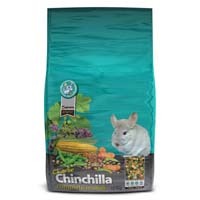 Chinchilla's need a high quality chinchilla food, that is low in fat and fibre, their food should ideally be bland and should be fed either a complete chinchilla blended mix or chinchilla pellets with good quality hay, that is an essential source of fibre for chinchillas, which aids the digestion process. Chinchillas are junk food addicts and will eat almost anything which tastes nice regardless of it's nutritional value. If chinchillas are fed a poor mixed food they will invariably eat all the yummy bits first and refuse to eat the healthier bits of the chinchilla food, simply because they do not taste as good. Selective eating may cause future health problems for your chinchilla as they need a nutritionally balanced diet with the correct vitamins and minerals. Consequently feeding a good quality chinchilla pellet or blended food mix such as charlie chinchilla and hay will ensure your chinchilla remains active and healthy. 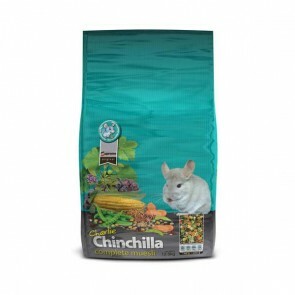 We are often asked by customers how to stop their chinchilla from selectively eating the bits of a blended complete food? The simply answer is to try feeding chinchilla pellets instead, which your chinchilla may not be too enthusiastic about, but it will help avoid your small furry friend from missing out on vital nutrition in a blended food. Like Rabbits and Guinea Pigs, Chinchilla's teeth continuously grow, therefore chewing on hay, twigs or wooded chews can help prevent dental problems from occurring. Chinchilla Food should be supplied with a fresh supply of hay and water everyday and their diet should be as dry as possible. All treats should be given sparingly such as; Dried Fruit, Breakfast Cereals and Toast which make ideal occasional treats. Do not feed your chinchilla: Peanuts, Muesli Mixes, Flaked Maize or Sunflower Seeds. Providing your chinchilla with chews and twigs will help prevent them from being bored. Chinchilla Food: 5 stars out of 5 based on 1 user reviews. Just recieved my first 2 bags of this food and was extremely happy! Its brilliant value for money. I used to buy another type of food for them which cost me £4.50 for a tiny bag which lasted 2 minutes. This food is absolutely huge and my chipmunks will be delighted. EXTREMELY HAPPY with this food. Thank you!